We are almost a month away from the first day of fall. This season allows for interesting and unique plants to grow in your garden during the later parts of the year. You know to always call before you dig, though do you know what to plant in the fall? Read below to learn more about a variety of fall planting options. Planting isn’t just a spring activity. If you’re wondering what you can plant in the fall, the answer is almost anything. Here are six plant types to put in the ground during the fall. 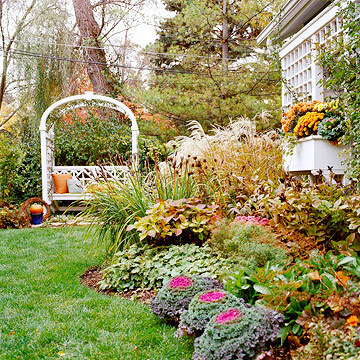 Use this list for fall planting inspiration. Fall is the best time to plant pansies because the still-warm soil temperatures give their roots time to establish. By planting in fall, you’ll get two seasons of enjoyment out of these cool-season favorites. Remove spent flowers so the plant doesn’t use its energy to set seeds, and keep the soil moist. After the soil freezes, mulch plants to prevent alternate freezing and thawing cycles that can heave plants out of the ground. Learn how to select and grow pansies. Learn more about cool-season crops. Learn more about planting trees and shrubs.